It's the third birthday of Sony Ericsson's Walkman phone label, and to celebrate it's launching three new music-based cellphones. The W302 and W902 (left, center in the image) are both candybar cells, with the 302 having an FM radio, and 2-megapixel cam, and the 902 with a 5-megapixel cam and apparently matching the high audio quality of the W980 phone. The W595 is a slide phone with built-in stereo speakers so users can "share sounds with their friends" (read: annoy passers-by with irritating tunes) but it also has twin jacks so you can share music privately. All four phones are quad-band GSM, have "shake control," come in a selection of colors and will hit the streets at the end of the year. Press release below, which also details some new accessories like wireless portable speakers. 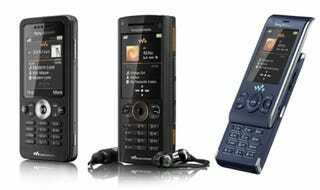 To coincide with the Walkman™ phone's third birthday, Sony Ericsson has unveiled three brand new mobile phones giving music on the go to more users than ever. Best-in-class sound quality takes music on your mobile to the next level. London July 22 - Building on three year's experience and technology 30 years in the making, Sony Ericsson continues to lead the way in the mobile phone music arena with cutting edge music technology and unique accessories. Today, Sony Ericsson unveils its latest innovative additions to the Walkman™ phone family: the W902, W595 and W302, and seven new music accessories. Sony Ericsson is unveiling phones and accessories with superior sound quality and pioneering features that take Walkman™ phones beyond music and expectations with fantastic extras such as great imaging and video capabilities. "Since the launch of our first Walkman™ phone in 2005, Sony Ericsson has continued to pioneer a superior mobile music experience - and the 77 million Walkman™ phones sold to date are testament to this commitment," says Ben Padley, Head of the Music Category at Sony Ericsson. "With this latest range of phones and accessories, we are offering high quality sound and a rich feature set that cements our position as a leader in the music phone category. We are pushing the boundaries of what people think is possible and are offering best-in-class sound quality and our most exciting Walkman™ phones to date." The list of pioneering and innovative features found on Walkman™ phones continues to be unmatched in the industry. Features like the music recognition application TrackID™, SensMe™, for matching your mood to the music and Shake control to change tracks with the flick of your hand make Walkman™ phones stand out from the rest. Sony Ericsson can now also announce best-in-class sound quality and a clear audio experience from its W902 Walkman™. The W902 features the same superior sound quality as the W980, about to launch shortly, which was rated "best audio experience" this month, in a trial conducted in Germany by TESTfactory*. With the W902, users can listen to music the way it should be heard: true to original. It's also a mobile phone for those that want it all, with a five megapixel camera and great video capturing and sharing capabilities, an 8GB Memory Stick Micro™ (M2) for storing more than 8,000 songs**, the W902 is a top-of-the-range device that will make you the envy of your friends. The W595 Walkman™ is perfect for those who want to share sounds with their friends. Store and play more than 1,900 songs** through the built in stereo speakers. Plug in the in-box sharing jack to listen silently to your tunes with a friend or Bluetooth™ your sounds to Sony Ericsson's range of wireless speakers. The new W302 Walkman™ is packed with impressive features in an affordable no-compromise slim handset. Targeting all audiences, the phone comes complete with an impressive two megapixel camera, FM radio, TrackID™ and 512MB Memory Stick Micro™ (M2). The next generation of accessories includes three new sets of speakers, the MBS-200, MBS-400 and MPS-100, to help music lovers go beyond the individual and play music directly from their mobile phone. Enhancing its music accessories collection Sony Ericsson has also introduced three new stereo headphones, HBH-IS800, HPM-88 and HPM-66 for the optimal listening experience. With Sony Ericsson today music is reborn. What are you waiting for? Join the Walkman™ phone family and experience music how it was meant to be heard. The W302 Walkman™ is an EDGE/GSM/GPRS 850/900/1800/1900 phone that will be available in selected markets in Midnight Black and Sparkling White in Q4 of 2008. The W902 Walkman™ is a UMTS/HSDPA 2100 and EDGE/GSM/GPRS 850/900/1800/1900 phone that will be available in selected markets in Volcanic Black, Wine Red and Earth Green in Q4 of 2008. The W595 Walkman™ is a UMTS/HSDPA 2100 and EDGE/GSM/GPRS 850/900/1800/1900 phone that will be available in selected markets in Active Blue, Cosmopolitan White, Jungle Grey and Lava Black in Q4 of 2008. The W595c Walkman™ is a GSM/GPRS/EDGE 850/900/1800/1900 phone that will be available in selected markets in Active Blue, Cosmopolitan White and Jungle Grey in Q4 of 2008. The W595a Walkman™ is a GSM/GPRS/EDGE 850/900/1800/1900 phone that will be available in selected markets in Active Blue, Cosmopolitan White, Jungle Grey and Lava Black in Q4 of 2008. The Wireless Portable Speaker MBS-200 will be available in selected markets from Q4 2008. The Wireless Portable Speaker MBS-400 will be available in selected markets from Q4 2008.